(《複数形》 ‐lice) 【動物, 動物学】 ワラジムシ. Any of the terrestrial isopod crustaceans of suborder Oniscidea, which have a rigid, segmented exoskeleton, often being capable of rolling into a ball, and feed only on dead plant matter, usually living in damp, dark places, such as under stones or bark. In addition, both the woodlouse and the crayfish possess an unpaired medial nerve which runs along the whole length of the ventral nerve cord, linking adjacent ganglia. Woodlice commonly produce offspring 1-3 times per year, with spring and autumn broods most common. Woodlice often survive for longer than a year, with longevity of 2-5 years not uncommon. The sections allow woodlice to bend and curve their armored bodies. Some types of woodlice can roll into a tight ball. They do this to protect themselves when threatened by a predator. Female woodlice carry their eggs in a liquid-filled pouch under their bodies. When the young woodlice hatch from the eggs, they crawl out of the pouch. A woodlouse (known by many common names: see ; plural woodlice) is a crustacean with a rigid, segmented, long exoskeleton and fourteen jointed limbs. 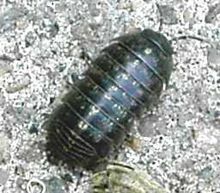 Woodlice form the suborder Oniscidea within the order Isopoda, with over 3,000 known species.